Preston Miller stands in front of the new fireplace in the main building. 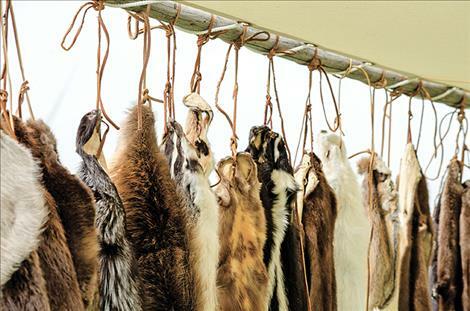 Furs are set up at one station for people to visit, reminiscent of the furs traded at the fort about 150 years ago. 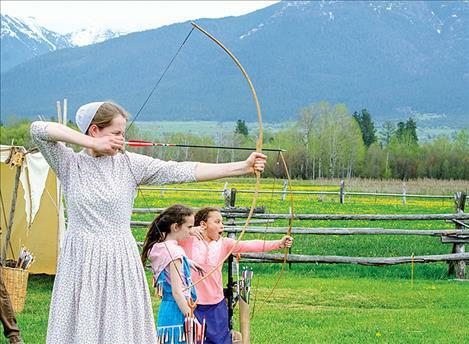 Hannah Fehr shoots an arrow at a target while Mikel-la, 9, watches her friend Rylee Taylor-Jefferson, 8. Rylee is the relative of Angus McDonald who built the fort back in the 1800s. 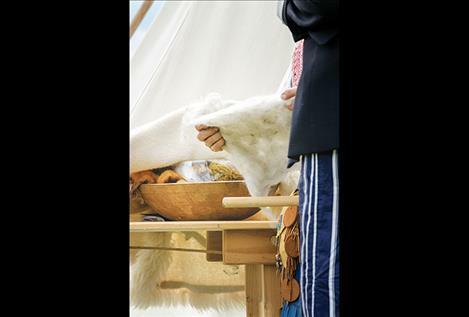 Wool is spun into yarn at one station during the Fort Connah live history days on Saturday. 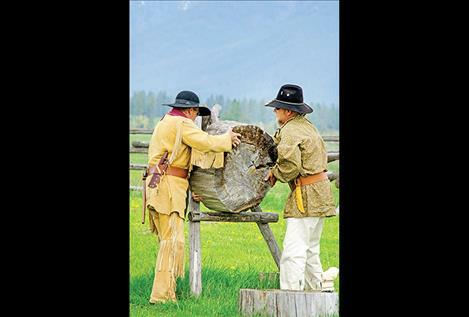 Mark Steele and Wes Targerson set up a wooden target for tomahawks. 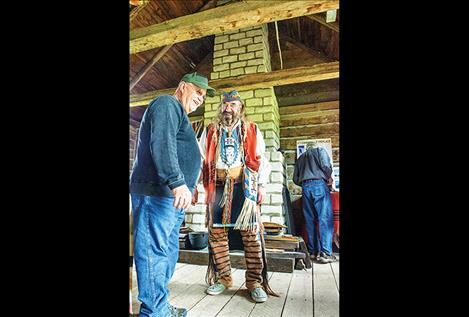 ST. IGNATIUS – The historic Hudson's Bay Fort Connah Trading Post opened last weekend for several live history days. 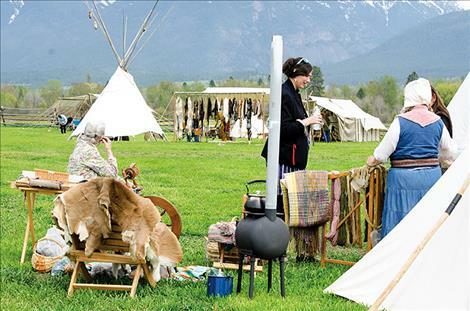 Folks dressed in buckskins and other time-era clothing to show what life might have been like back in 1846 during the fur trading era when the post was open for business. 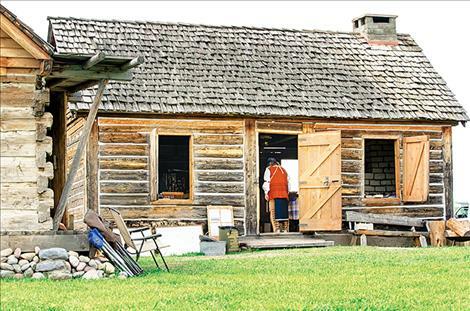 The original cabin on the site, about seven miles north of St. Ignatius, is thought to be one of the oldest cabins in Montana. 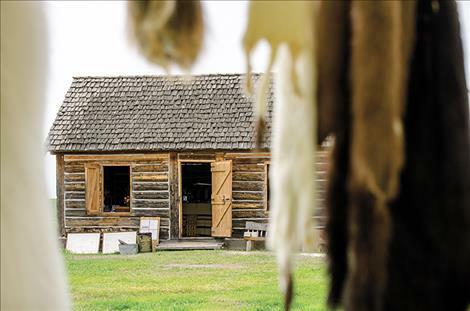 Fur trader Angus McDonald developed and lived on the site with his family. 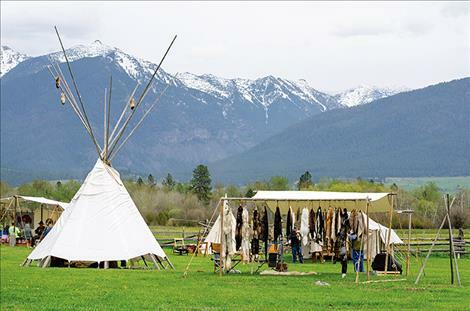 He traded furs, buffalo skins, saddle blankets, and other items. 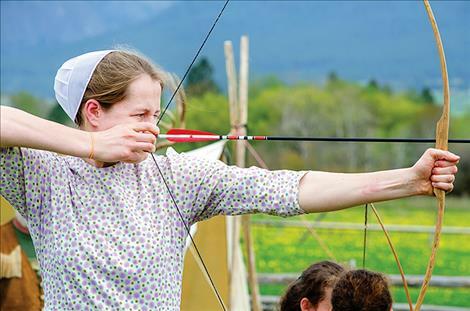 Rylee Taylor-Jefferson, 8, is a descendent of Angus. She was at the event in a Native American style dress. Her grandma, Tracie McDonald, said Angus is Rylee’s great-great-great-great grandfather. Tracie only counted a few greats with her own history. 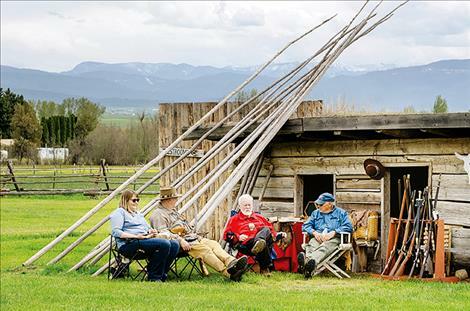 The relatives sat in a teepee at the event making beaded jewelry. “I feel a connection to this place,” Rylee said. She added that it was amazing to be able to attend an event celebrating her ancestor. Tracie said many people attended the event this year. 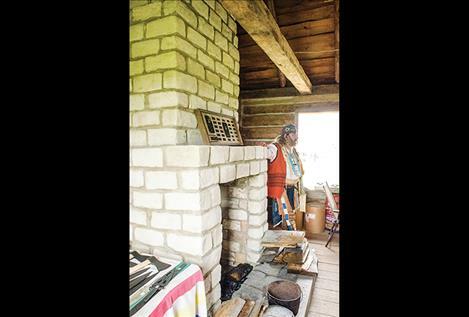 She was glad to see so many people interested in what the Fort Connah Restoration Society has done to preserve the location. She pointed out a few buildings and the new corrals, which have all been added to make it look like it once did. In the original building, a newly built brick fireplace sits against an inside wall. Preston Miller helped mix the materials to make the new bricks. The plans for the design (a sketched drawing) were found at the University of Montana library. Filling in chinking and building new fence are projects the restoration society hopes to work on in the future.